Let’s say you want to hire an electrical contractor in Mesa. What do you look for? First off, he should have a license. Does he have a record at the Arizona Registrar of Contractors? If not, why? If you have established the fact that they have a record with the ROC, do they have any complaints filed, either with the ROC or some other body such as the Better Business Bureau, review sites, etc. A complaint is not necessarily a bar to hiring them. Look over the complaint thoroughly. If it is a complaint about the way the electrician acted, that’s iffy. However, if it is a matter of incompetence, go find another qualified Mesa electrician instead of just picking the wrong one. Next up, look at their hours of operation. If they’re only open Monday through Friday, 8am to 5pm, and you work those hours then you’d better have someone at the house to let them in to work or take the day off. Sounds a bit daunting, but under no circumstances, should you try to fix your wiring yourself, and here’s why. You can put your home and in some cases your life in jeopardy. Simply mixing aluminum and copper wiring together can cause a chemical reaction later on that can cause an electrical fire. 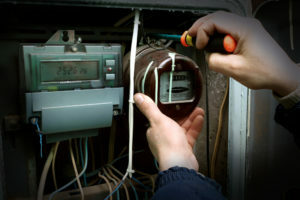 If you mix the wrong gauges of wire together, it can cause a short, or if you put too much on an electrical circuit it can cause a breaker to constantly trip. We once had a client who added a home office. He thought that he could do everything from the framing to the wiring. He did a good job on the framing, to his credit, but the wiring, well not as much. He was lucky. All that happened was the breaker tripped, and it shorted out a light switch. In another time and place however, he could have easily seen an electrical fire engulf his home. Surprisingly, doing your own wiring yourself doesn’t always save you money. If, for example, you don’t know what you’re doing, you’ll have to pay an electrician to come in and fix the problem. And you will have ended up wasting money on all of the tools and supplies that you bought. So be smart. Do it right the first time. Hire a licensed electrician in Mesa instead.